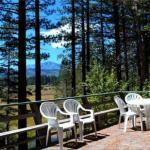 Lindberg Chalet a property with barbecue facilities is located in South Lake Tahoe 2.5 km from South Tahoe Ice Arena. Guests staying at this holiday home have access to a fully equipped kitchen. The holiday home is fitted with 3 bedrooms and a living room with a satellite TV and DVD player. Heavenly Ski Resort is 3.8 km from Lindberg Chalet South Lake Tahoe. The nearest airport is Reno-Tahoe International Airport 68 km from the accommodation.